« Winner of the Giveaway! 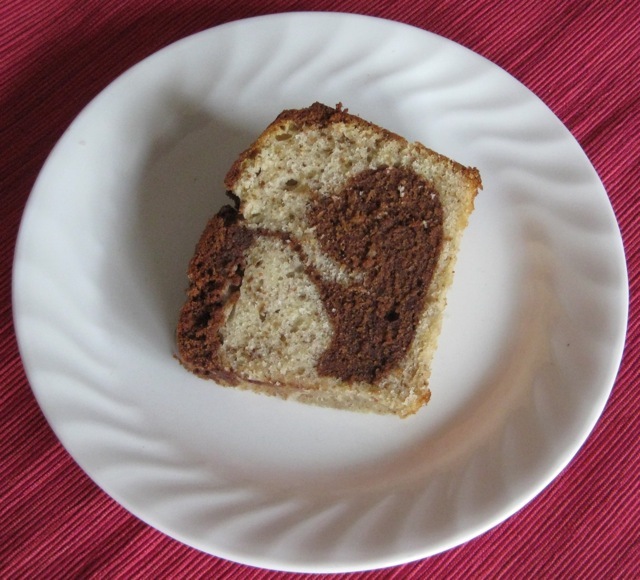 This week’s Tuesdays with Dorie recipe is Mocha-Walnut Marbled Bundt Cake. This was a darn good cake. I thought the ground walnuts were a fabulous element in the cake – they added a wonderful texture and flavor. Although I’ve been known to say that “marble cake should make up its mind,” I actually liked the two flavors. I did, however, try not to over-swirl it because I wanted to taste each part separately. It looks kind of cool, doesn’t it? I made the whole recipe without any major alterations. We ate a little bit of it and split the rest between my office and my husband’s office. This is an easy-to-transport, tasty cake! I thought it was great as-is, but I bet a lot of the Tuesdays with Dorie bakers jazzed it up with glaze, frosting, and/or ice cream. If you want the recipe, look on page 180 of Baking: From My Home to Yours, or head over to When in doubt…leave it at 350, where Erin will have the recipe posted. I laughed at “it should make up its mind.” That’s so funny! Your cake looks beautiful! This recipe was SO delicious! I will definitely make it again! Nice swirl! This recipe’s a keepeer. Your cake turned out well, and so glad that you enjoyed it. Your marbling looks great! Almost like a hippy style print! LOL Bravo! Oh! And I want to thank you for not letting me down while I was sick and not feeling like surfing the net to comment myself! Very appreciated! We liked it too, as-is, with no special additions either. Yours looks great Jill! I loved the ground up walnuts too. Im glad you liked the cake. I made mine into muffins! Great job!! I’m sure the colleagues loved it! Mine didn’t get to taste this recipe, I turned it into cupcakes, topped them with DDL Buttercream and gave them to my brother. Oh, I love the pattern you got from this…it’s so pretty! I didn’t get a chance to make this before we left on spring break, so maybe when we get back. I am using my down time in bits and spurts to get caught up on blog commenting as I fell behind in Lent. Had to get right over here to see what’s happening! Beautiful cake, that’s what! I thought this cake was super delicious by itself – no adornments needed. I love the marbling of your cake – beautiful! Love teh swirl. I over swirled mine. No adornments necessary with this cake. I’m glad you liked this one. It’s one of my favorite TWD recipes now. I was afraid that there would be too many flavors going on, but it was wonderful! And what a pretty swirl! Nice cake. Love the marbling. I made minis, so the marbling wasn’t easy. Good cake though. Nice looking cake you’ve got there! It was a tasty little thing, wasn’t it? Look at the perfect ginko leaf pattern that you made in your marbling! I understand where you’re coming from with “marble cake should make up its mind.” Sometimes it’s as though there isn’t enough of one flavor and the result is unsatisfying. That said, I really enjoyed this cake and I’m glad that you liked it, too! Nice job on the marbling! LOL about the cake making up its mind! Marble cakes have never been something I’ve gravitated towards, but this one was delicious. I love how your cake turned out. The chocolate in the middle reminded me of a conversation bubble. Thanks for baking with me this week. It looks absolutely perfect! A perfect ginko! I think that swirl has made up its mind to be stunning! I didn’t get a chance to make it, but will have to add this to my ever-growing pile of things to bake! Jill -I think the swirl is perfect – much like a ginko leaf! I didn’t swirl mind but it ended up looking swirly… strange. No matter – it was my favorite cake now! I agree – it was great by itself! Looks fantastic! What a lovely marble. Mine didn’t look so pretty, but the Guinness reduction drizzled over it made up for that pretty well. This cake was easy to travel with. I ate 4 pieces on my drive home from California. The cake looks delicious and I love the idea of the ground nuts!